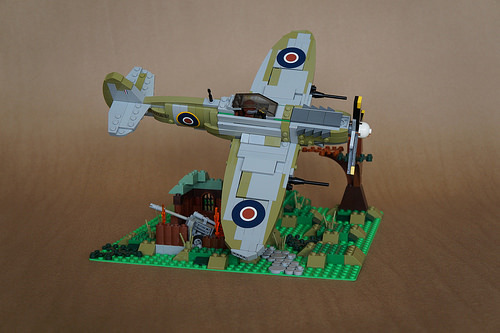 Per Ardua Ad Astra — “Through adversity to the stars” — the motto of the UK’s Royal Air Force, and what sprang to mind as Paul Nicholson‘s LEGO version of a Supermarine Spitfire thundered into view. For a small model, the shaping is pretty good, capturing the iconic elliptical wing shape well, and there’s a nice mix of colours to create a camouflage effect. And the use of 1×1 “cheese slopes” delivers the essential touch of the raked exhausts down the sides of the engine. I’m less of a fan of the forced-perspective base — I think the presentation would have benefitted from further separation of the plane from the ground, and perhaps a tighter depth of field pushing the background out of focus. However, despite those minor photography gripes the plane itself is a cracking model, immediately recognisable and eminently swooshable.